Your troop want to go to Sky High (indoor trampoline park) as a back to school celebration. Where would you find safety rules for that outing? Safety Activity Checkpoints located in Leader Resources online (replaced Safety Wise). We also learned that while girls cannot go trampolining, they can do indoor skydiving! Your troop just finished their Bronze Award (or other award or service project or fun trip), and you have a great group picture to share. Where can you share it? How do you submit the photo? Golden Link – Deadline for submitting items is the first of the month two months prior to publication. Send news and photographs to The Golden Link to jpastal@sjgs.org. Send Scrapbook photos to menzor@sjgs.org. Your troop wants to hold a bake sale to raise money for the local animal shelter. Where can you find information about fundraising? There are very specific rules related to raising money for organizations other than Girl Scouts. Your troop may want to consider making non-monetary donations or contributions to other organizations rather than holding a fundraiser. A Daisy troop is forming at your school. The new leaders ask you for guidance/ideas on what to do for their first few meetings. You would love to sit down and help them map out their meetings but are short on time. Are there any resources you can direct them to? Where can you find them, and what information do they contain? Leader Resources page, left side link to New Leaders has the 1st 4 meetings guides for Daisy, Brownie, Junior. Includes ideas for troop meeting places, checklists, songs, games, etc. You are trying to get a parent volunteer to be the troop treasurer. The parents are concerned because none of them are accountants. What resources do leaders and treasurers have to make troop finances easy? When should leaders start working on their financial report? Girl Scouts provides your troop treasurer with the resources and support to do the job, so they do not need to have any special skills other than the ability to balance a checkbook. Go to the GSSJC Program Activities page, which can be found under the Quick Links box on the right side of the GSSJC home page. You have a parent in your troop who is camp trained and attends every camp out. He has also taught your troop knife skills and knot tying and picks up your troop cookies from the cookie mega drop each year. You want to show your appreciation. Three volunteer members responsible for coordinating the Girl Scout activities in our Community by providing administrative coordination of the CST as well as serving as the connection with Council to ensure that Community Volunteers receive information from GSSJC. A group of volunteers who plan and coordinate direct services to individual troops/groups. CST roles include: Communication Coordinator, Treasurer, Financial Specialist, Registration Specialist, Placement Specialist, Facilitator, Girl Planning Advisor, Event Team Lead, Mentoring Team Lead, Recruitment Team Lead, Product Sales Team Leads. The CEM and VEM are Girl Scout staff positions who work in partnership with Community Leadership Teams to provide support and advice for membership development and support. 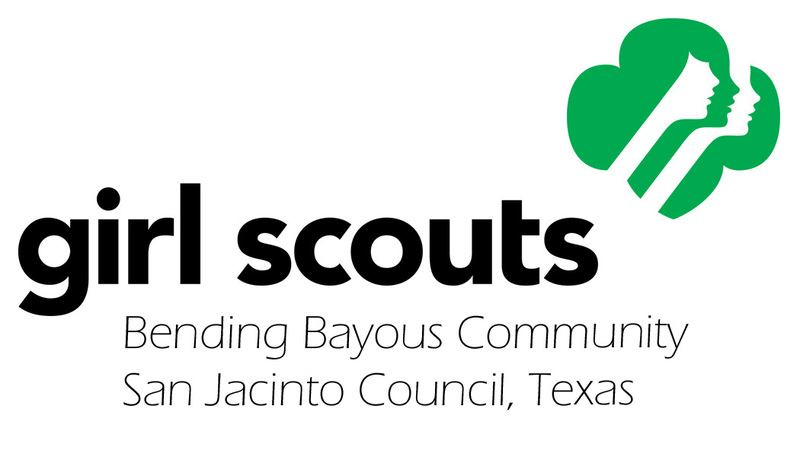 Girl Scouts of San Jacinto Council serves 26 counties in Southeast Texas, including: Angelina, Brazoria, Chambers, Fort Bend, Galveston, Hardin, Harris, Houston, Jasper, Jefferson, Liberty, Matagorda, Montgomery, Nacogdoches, Newton, Orange, Polk, Sabine, San Augustine, San Jacinto, Shelby, Trinity, Tyler, Walker, Waller and Wharton.